How to choose and set up a stereo amplifier | What Hi-Fi? While we like the idea of plug ‘n’ play set-ups as much as anyone, there’s more to getting the best out of stereo amplifiers than simply powering them up on a hi-fi rack, plugging in speakers and going wild with the volume dial. If you’ve already purchased an amplifier and are now eyeing up your latest purchase with a view to getting started, you may wish to skip straight to the ‘system matching’ section. But if you’re reading this before you’ve chosen the two-channel amplifier needed to drive your system, you have an important decision to make. Do you go for an integrated amplifier or separate pre/power boxes? The former is the most simple, convenient and space-saving option - it packs both pre- and power amplification into one chassis. This means everything has been tuned together, saving you the work that goes into matching separate amplifiers. Two-box amplifiers, on the other hand, involve splitting pre-amplification (input selection and volume control, fundamentally) from power amplification (go on, guess). The idea is to keep the sensitive preamp circuitry (and the delicate audio signals flowing through it) away from the the electrically noisy high-current power amplifier section. Having separate power supply sections helps to improve the sound too. So this way you double your component-count but, as long as your pre- and power-amps function together sympathetically, you should enjoy better performance. The most obvious way of selecting pre- and power amplification that works together well is by sticking within one brand’s range. Invariably they will have been tuned to work well together. If you plan to go off-piste and mix-and-match, be aware some pairings will work better together than others. The best way to find out which is which is by trial and error. And that's true when it comes to matching source components to your amplification. Sonic affinity can be determined by common sense to some extent. If your source – a CD player, for example – sits on the bright side of neutral, it shouldn’t be partnered with a stereo amplifier with a similar character. An amplifier’s partnership with stereo speakers is extremely important, and there are a few things worth considering to ensure they complement each other as well as Wensleydale cheese and wheat crackers. Ever scratched your head when faced with specs such as '75W into 8 ohms'? Allow us to explain. The speaker/amp partnership not only comes down to an amplifier’s power output (how many watts it can deliver to each channel of a music signal) but also impedance (measured in ohms) and sensitivity (dB). Impedance is a measure of how difficult the speaker is for the amplifier to drive. The sensitivity of a speaker, meanwhile, is a measure of how loud a speaker will go for a given input. The standard way to measure an amplifier’s output is by connecting it to an 8-ohm resistor and measuring the power before distortion becomes too high. However, the electronic load of a speaker is far more varied than a simple resistor, so we’d be careful about judging the strength of an amplifier simply by the 8-ohm power figure. A better insight into an amp’s muscularity is to compare its power output into 8ohms with that into 4ohms. An ideal amp would double its output as impedance halves; so, though most won’t achieve it, the closer it gets the better. Though you may be tempted to go for the most powerful amp you can afford, you’ll usually do better by buying a more sensitive speaker. That’s because an amplifier’s output has to double to match a 3dB increase in speaker sensitivity. But numbers can only tell you so much, and the best test to gauge if components work well together is to use your ears and have a listen. So you’ve found a match. That brings you to your next question: where to put it? The surface your stereo amp sits on can make the world of difference to its performance. IKEA furniture might not be at the bottom of our list (that’s the floor), but we’d strongly suggest placing it on a dedicated hi-fi rack. Your choice of rack shouldn't be based on looks alone. Different materials have different acoustic properties, so take that into consideration too. Generally speaking, glass shelves tend to encourage kit to sound forward, while wooden supports tend to result in a warmer and more rounded balance. All that power under its hood can build up quite a temperature, so it’s also important to give an amp a few inches of breathing space from a wall or rack to stop it running too hot or overheating. Before you place its back to the wall, it’s worth looking at your stereo amp’s rear panel to see what options are available regarding connecting sources, extra speakers and future upgrades. All stereo amps have line level RCA inputs, which can be used for all the usual sources - streamers, CD players and so on. One of those RCA connections is sometimes a phono input, designed specifically to be connected to a turntable and handle the very low signal levels and extra equalisation required for such a source. Then there are three-pin XLR connections, which carry balanced audio signals. These are usually found in recording studio and most higher-end products. Its main advantage is that it will reject high levels of electrical noise and thus makes the most sense when used in electrically noisy environments or over very long cable runs, say 10m or more. Balanced operation doesn't always sound better, though, and much depends on the components used. Rega is among the brands to have stuck to analogue-only amplifiers, with its Award-winning Brio, Elex-R and Elicit-R models. Not so long ago we championed an analogue-only Luxman L-509X. But, even at the budget end of the market, many stereo amps now feature a digital-to-analogue converter (DAC) – and thus digital inputs – to increase their versatility. If that sounds like yours, you might well be faced with several types of digital inputs. Optical connections transmit a digital signal from one device to another via fibre optic cables and laser light, while the equally common coaxial S/PDIFs carry signals electrically. USB inputs, which come in various forms, are often present for the playback of USB sticks, laptops or hard drives, too. The Marantz PM6006 UK Edition, Cambridge CXA60 and Moon 240i are examples of particularly well-connected stereo amps. You can plug your CD player, streamer or laptop into the amps via their multiple digital inputs. Usually though, the performance of an integrated DAC leaves much to be desired compared to an outboard DAC. Bluetooth is increasingly making its way onto the features list of many amps. The Audiolab M-ONE and Cyrus One models have built-in Bluetooth, for example, while the Cambridge CXA60 is gifted it through a dongle add-on. The NAD C 368 even has wi-fi onboard for network streaming, although that’s unusual for an amplifier. Regarding outputs, there’s sometimes one to add an external subwoofer for bringing extra sonic heft to a system. Tape outputs are fixed line level outputs (i.e. not affected by the amplifier’s volume control) that send a full level signal to the connected kit – normally a tape deck. But one of the most common inclusions is a 3.5mm or 6.3mm headphone output for, err, connecting headphones, and often features on a stereo amp’s front panel. Some stereo amps also have two sets of speaker terminals – usually labelled zone ‘A’ and ‘B’ or ‘1’ and ‘2’ – which allow you to run two pairs of speakers at the same time (in different rooms, for example), although this can have a detrimental effect on performance as essentially the amp's power is being shared multiple ways. There’s also the option of bi-amping, which requires at least two stereo power amplifiers (unless you have a multi-channel receiver with spare channels) and some more cables. The idea is that each amplifier handles certain frequencies or channels, instead of one handling it all. By reducing the number of drive units an amp needs to power, you make its job easier and it sounds better. Upgrading doesn’t necessarily mean out with the old, in with the new. Your amplifier may already have an upgrade path. 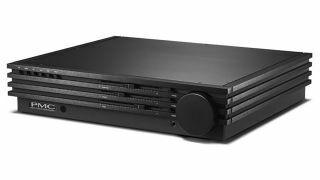 Some manufacturers such as Naim and Cyrus have dedicated connections for adding external power supplies. If an integrated amplifier has pre-amp outputs, then using it solely as a pre-amp and passing amplification duties onto another amp, is another great way to upgrade. There’s also the option to upgrade your amplifier’s mains cable, so we’d take advantage of the fact most dealers will let you try before you buy. Whatever the rest of your hi-fi system and your future plan for it, introducing a new stereo amplifier requires some thought and a bit of advanced planning. If you bear in mind everything from the type of equipment your amp is going to be paired with, to the type of rack you will put the thing on, and consider your options for future upgrades, then you’re destined to make the most of your amplifier.